Thousands from Portland schools rally Friday at Portland City Hall to demand action. 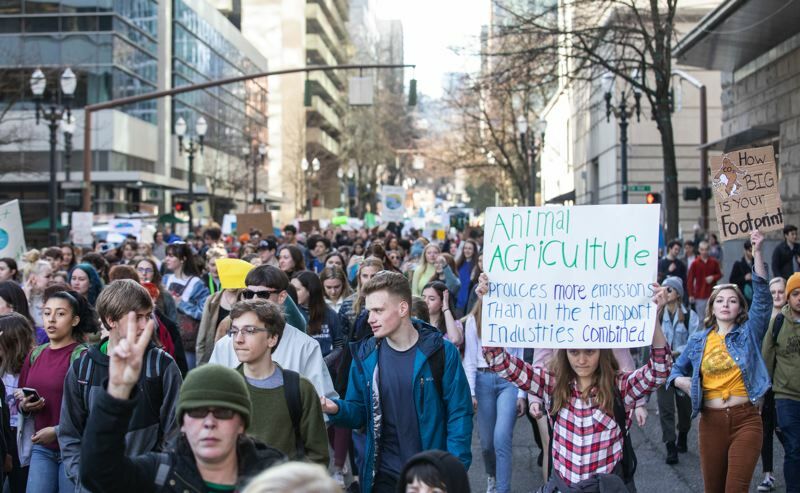 Thousands of students overtook downtown Portland streets Friday, March 15, to demand swift action and better education on climate change. Students from throughout the Portland Public Schools District organized a Youth Climate Strike, in conjunction with a global movement by students to demand better climate change education and action to move away from fossil fuels. 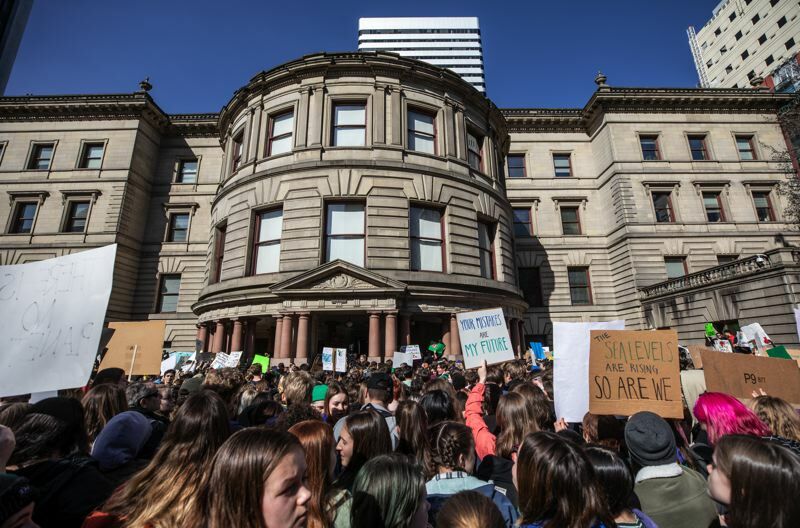 Friday's march in Portland saw students walk out of class and take city buses to Portland City Hall, where they gathered en masse, made signs and heard speeches from students and Portland City Commissioner Jo Ann Hardesty. "You are exactly what we have been waiting for," Hardesty told students crowded around her. "Leadership comes in all ages. It comes in all colors. It comes in all cultures and you have showed up proudly today. "You are the ones that will make us draw a line in the sand and say 'no more,'" Hardesty added. "I have never been prouder to represent the city of Portland than I am at this moment." Students said education about the climate change has fallen short, despite a resolution passed unanimously by the Portland Public Schools board in 2016 aimed at eliminating doubt in schools over climate change and its causes. "Since the policy was passed, it has yet to be implemented in any meaningful way," said Jaden Winn, a sophomore at Wilson High School. "It's not visible to students." Winn, 16, helped organize Friday's climate strike. He said he was inspired by fellow 16-year-old Greta Thunberg, a Swedish teen and political activist whose calls for action to address global warming and climate change inspired millions of students across the globe to protest on Friday as part of a global climate strike. Winn said he and his peers across PPS want the district to fully implement the resolution and they want to see Oregon lawmakers support the Green New Deal and pass the Oregon Clean Energy Jobs bill. "The adults today don't have a massive amount of climate literacy and they don't understand the crisis," Winn said Thursday, as he geared up for the protest. The young activist has been noted for founding Youth Igniting Change, an organization that works to combat and address homelessness in Portland. He and his high school peers point to a report released by the United Nations from the Intergovernmental Panel on Climate Change, which calls for limiting global warming to 1.5 degrees Celsius, to avoid further damage to agriculture, oceans and ecosystems across the globe. "I really think we should prove that we deserve to be here," Dashielle Swain, a 14-year-old Mount Tabor Middle School student, said Friday outside City Hall. She said she took part in Friday's march because she's worried about her future. "Most of the destruction is because of us. The pollution, the industrial machines. I want to be here on this planet." Students who took part in Friday's climate strike were notified by PPS that they would receive unexcused absences and some students said they were told they would not be allowed to participate in spring sports as a result of the absences. PPS released a statement to parents, explaining Friday's planned walkout and march, saying that while the district recognizes the rights of students to assemble, it encourages them to do so outside of school hours. "We encourage families to have a discussion with their students and to come to an understanding about participation in any student-led off-campus activities," the letter stated. "Please know that PPS administration will do its best to monitor student activity, but it cannot effectively supervise every student who chooses to leave campus for a non-school-sponsored event."